This is our fourth article on the subject of Aerospace Validation. For previous articles, see this introductory article on Boeing Validation Spec D6 (which focuses primarily on data extraction), part 2 of the same article (which focuses on validation of derived CAD models), as well as this article on the AS9100 standard (which is more commonly used in Europe). Section 19: Does the supplier verify dataset translations when a supplier translates Boeing authority datasets from their as received format into their manufacturing or inspection software? – When translations of digital datasets occur between CAD systems or digital equipment a process must be in place to verify data. Examples of how this can be accomplished are using IGES_CHK, point cloud method or other software validation processes. – See matrix at end of this guide for site specific data exchange requirements. Solution: Datasets can be verified and validated by MagicCheck both in terms of part-to-part and point-to-part, i.e., comparing CMM or other point data to authority model geometry and generating deviation point lists. Both part-to-part and point-to-part validation results can then be used to automatically generate PDF reports. 2. Does the supplier have a documented process to create inspection media from a 3D MBD model? – Process to determine when manufacturing and/or inspection views/sketches are needed to supplement authority dataset. – Obtain measurement values of all product features from Authority Model. – Note: is supplier utilizing equipment capability (CAD, LEV, and CMS) to minimize/automate creation of inspection views? Preferred method is to utilize digital methods vs. creation of 2D media. Solution: TransMagic allows the creation of inspection media on several levels; beyond the validation checking MagicCheck does, there is also output to 3D PDF. Inspection views can also be created with the View Browser, and these can be optimized in terms of background color, dimension color, dimension visibility and view orientation. Measurements can be obtained from product features and written to saved PDF views (2D or 3D). 3. Does the supplier have a process to ensure verification of all design requirements of the authority dataset? – Measurement process must have guidelines to ensure the appropriate quantity of individual measurements are taken on the feature being measured (i.e., quantity of surface points for measurement, CMM hits). – Process to ensure Key Characteristics identified on authority datasets are measured and the results are recorded for every unit. – (Digital methods preferred to 2D media). Solution: MagicCheck allows users to import CMM point data, displays distance of every point from the surface of the authority model, allows users to reduce point cloud data to manageable numbers, and makes automatic reports with all point data. 4. Is there a process in place to document FAI’s for product produced from MBD datasets? 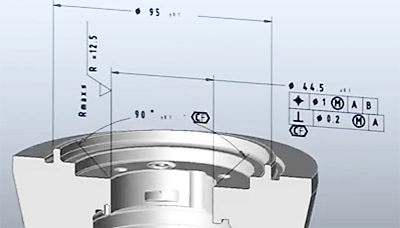 – Measurement planning must have guidelines to ensure the appropriate quantity of individual measurements are taken on the feature being measured (i.e., quantity of surface points for measurement, CMM hits. Solution: TransMagic allows the user to create custom 3D views of geometry with full control of visible dimensions per each view, and save views out to PDF. Views, dimensions and markup tools can be used for measurement planning. 5. Does the supplier have a process to assure sub-tier suppliers’ ability to work with MBD information? – Supplier has assessed sub tiers onsite and ensures the proper capabilities to manage and use the Boeing DPD/MBD datasets being provided. – Supplier has documented process to ensure dub tier suppliers inspection planning is compliant when used to accept Boeing product. 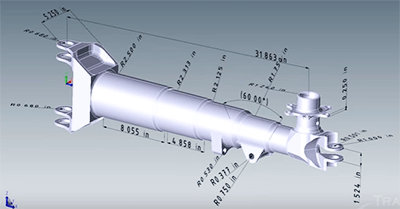 – Supplier documented processes ensure sub tier CAD systems/format are verified when dataset translation occurs. – Must control sub tier DPD/MBD suppliers to the same standard as prime supplier. Solution: TransMagic and MagicCheck are a viable solution for both suppliers and sub-tier suppliers to work with MBD and PMI information, inspection planning and verification of dataset translation. All versions of TransMagic support the PMI View Browser, a tool which allows you to visualize PMI in one of six orientations, and turn PMI captures on and off; note in the example at right, the PMI capture is of a hole section, further reducing the need for 2D drawings & sections. Find out more about the MagicCheck add-on here.